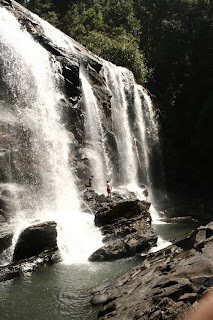 Almost two months back we went to explore a new water falls called 'Belli Gundi'. No one of us knew the route. We have only heard the name of the falls. Some one told us that the route is very tough and we have to walk in the deep forest for 13 k.m. They described it as a 600ft height falls. After hearing all these we were very much excited and decided to go there. Meanwhile some of my friend told there is another route which is just 3 k.m trek. There you can see the water falls at a relatively long distance. We decided to chose that route . One morning we left the place early in the morning to discover the falls. After 45 k.m . we reached a place called 'Kattinkaaru' where we had to take deviation and enter into the forest. No one was there to guide us. After searching for 2 hours we could find a old man who was willing to show us water falls, but not Belli gundi instead 'Booralu Gundi'. We followed him. after 3 k.m walk in the forest we reached "Booralu gundi" which is really a awesome place. It's very less explored place. Very a few outsiders have seen this place. After exploring each and every corner of that falls we decided to climb down to see other falls.The old man who took us there warned us not to go there as no one has climbed down till date. we were there to explore the place . we wanted to discover new places.We were not at all in the mood to listen him. With lots of difficulties we managed to climb down. Wah!! what a scene !! The real beauty of the place lies here. It was amazing sight. The water was falling almost from 150ft height. And the width was no less than 150ft. 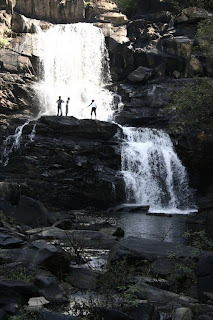 This falls is called Maaralu Gundi"
we were very happy.Our task was almost accomplished. While coming back we took a small deviation and reached to a valley point. From there we could see Arabian sea. If we waited till sunset we would have witnessed sun setting in the Arabian sea. On other side from a far distance we saw "Belli Gundi"falls which was falling from almost 400ft height. We are planning to explore that place in near future. Hope very soon I will be coming infront of you with that story. Western Ghats have loads of undiscovered secrets! Sometimes its amphibians, sometimes its plant species and sometimes some hidden gems like these places! Kudos to your efforts in reaching there! i love this place. I really really want to go here. Could you give me some more information as to how to go to this place, please. I will really appreciate your help. Hey u guys r super. Thanks for the info. But I am afraid that unwanted ppl will visit there n make the place dirty.... It would be grt only nature lovers visit the place n Njoy the nature without harming... Also is it possible to give the place name I detail where exactly the falls is situated...?